New Vinyl Plank Flooring gives homeowners many style and cost options. Sheet vinyl is a more cost effective, warmer option than tile flooring. Vinyl is easy to maintain. Sheet vinyl is now offered in a thicker, more flexible product which allows for more flexibility with subfloor imperfections. Vinyl also has more texture to the surface and matte finishes to mimic the appearance of ceramic and hardwood and make wet floors a bit less slippery. Groutable, luxury vinyl tile is also an option and appears to be real ceramic or stone. 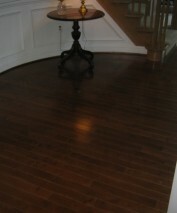 This product can be installed as a floating floor or glued to your subfloor. The grout is a latex grout. Dirt doesn’t absorb in to the grout, as in typical tile grout. This makes cleaning and maintaining the luxurious look of tile easier.